Better storage, protection and order. A plastic tray is not only an optimal packaging, but also serves as a reliable protection of goods during transport. In addition, the plastic tray, like other deep-drawn parts, makes it easier to arrange the goods and thus also to count them – for example in the case of an inventory. 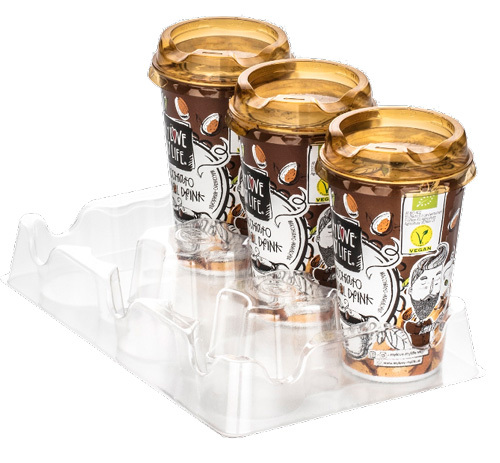 We at Scafa Thermoforming develop the perfect plastic tray for your individual goods with a lot of expertise. 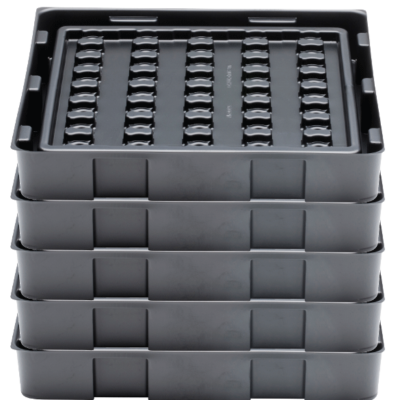 Because we know that it is impossible to imagine automated logistics without the plastic tray – and we know this area very well. 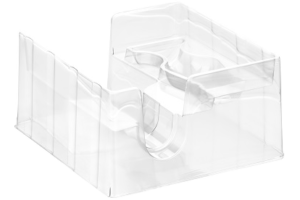 Whether plastic tray or blister packaging, Scafa Thermoforming is your experienced partner when it comes to tailor-made packaging solutions. You set the direction, we set the design. Sensitive electronics need the best possible protection. The use of electrically conductive materials prevents electronic charging and discharging at the trays. Our plastic inlays are individually tailored to your product and the corresponding outer packaging, so that everything really sits firmly in the packaging. A tray is not only an optimal transport packaging, but above all serves to reliably protect goods during transport. It also makes it easier to arrange the goods. Our disposable trays are provided with material marking in order to improve the recycling routes. 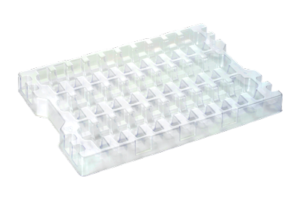 Reusable trays are usually very easy to stack and ensure the safe transport of your products. 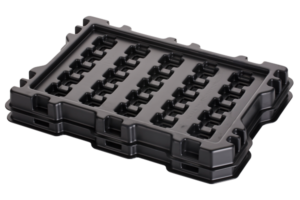 Our transport trays ideally protect your products from dirt and damage. Our ESD trays are especially suitable for further processing as well as the transport of electronic assemblies such as printed circuit boards, electric motors but also individual components such as resistors, capacitors, coils or diodes. 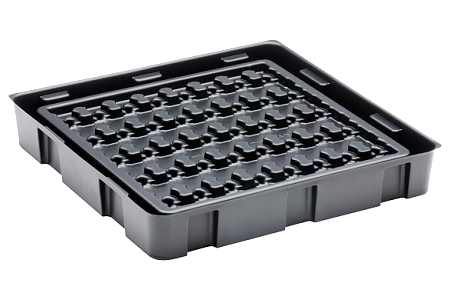 Trays facilitate logistics for large quantities, as plastic trays are easier to stack than loose goods and can therefore be transported more safely. Plastic trays make it easier to count the goods in an inventory. Furthermore, our art packaging is suitable for automated as well as manual packaging processing and assembly work. In addition to plastic trays (workpiece carriers), our portfolio also includes other types such as transparent packaging, which we manufacture according to your individual requirements. These include sealing blisters and blister hoods, sliding blisters and Hf blisters. We help you to solve your packaging problem.